I'm such a lucky girl to be able to test various Lush products. The last weeks I've been addicted to the rose products of lush. If its getting colder outside, theres nothing more comfortable than to get a hot shower with a delicious showergel. 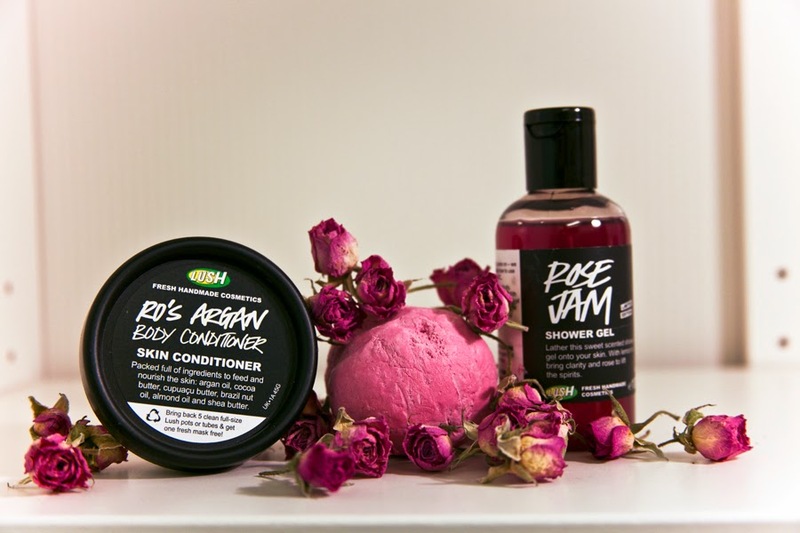 My favorite at the moment is Rose Jam from Lush. As you can guess by its name, it smells like rose jam. It really smells as sweet that it tempts you to eat it. To treat my dry skin afterwards with nourishing body conditioner I use the one from Lush, named Ro's Argan which smells like a rose garden. If you like perfumes like Miss Dior Chérie or Chloé Chloé you will definitely love this skin conditioner and the shower gel. And on top there is also a bath ball, pretty colored in rosé. I've you're the romantic kind of girl ( I suppose no men ever would do this, to treat himself. Correct me if I'm wrong) you can add some dried roses to the bath and feel like a princess. If you're still looking for a christmas present, Lush has got a lot of beautiful gift sets. I can hardly resist, the packaging is so cute. Just check them out here.